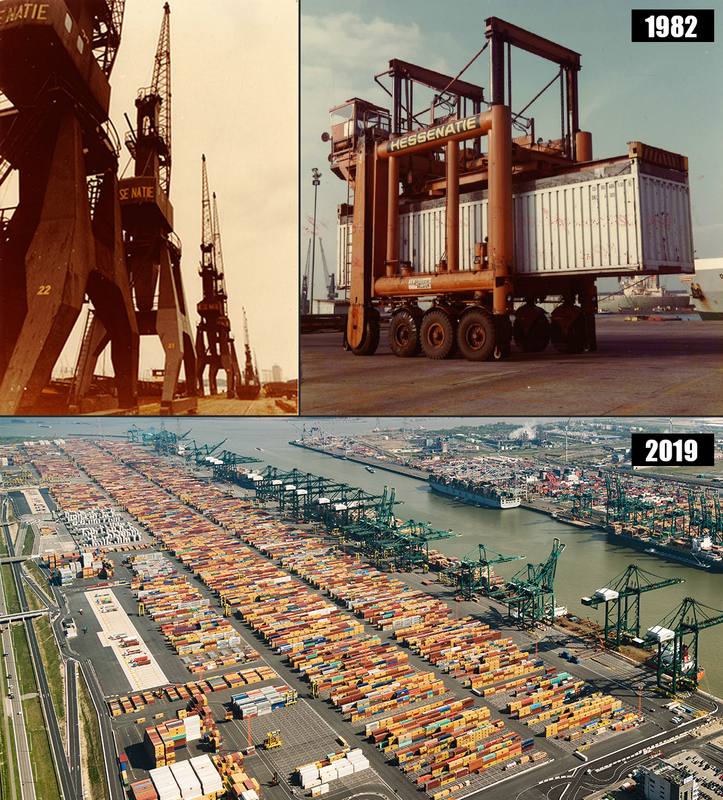 PSA Antwerp’s story began in 2002, with the merger of two-well established port operators, Hessenatie and Noord Natie, each bringing together a wealth of experience and hundreds of years of port operating history. This single entity was subsequently brought under the umbrella of Singapore-based PSA International, one of the largest port groups in the world specialized in container handling. The PSA Group participates in port projects across Asia, Europe and the Americas with flagship operations in PSA Singapore Terminals and PSA Antwerp. As the port operator of choice in the world's gateway hubs, PSA currently processes some 220,000 containers per day, which amounted to a total for 2018 of 81 million TEUs (twenty foot equivalent units). The terminal in Singapore accounts for almost half of this volume. The Belgian PSA Antwerp, PSA’s largest investment outside of Singapore, processed around 10.3 million TEUs in 2018. PSA Antwerp is referred to as the PSA group’s second flagship. In Antwerp, PSA operates 3 container terminals: MPET at Deurganck dock (a joint venture between PSA Antwerp and TIL), Noordzee Terminal and Europa Terminal). Over 80% of all containers coming into Antwerp, pass through one of these terminals. In addition to container handling, PSA is also active in general cargo handling on the PSA Breakbulk Terminal. PSA can draw upon a talented pool of experience and expertise of a workforce of approximately 3,000 employees in Antwerp to manage our complex operations. Thanks to their hard work and motivation, PSA Antwerp is playing a significant part in making the group’s slogan, ‘The World’s Port of Call’ a reality. PSA operates 3 container terminals in the Port of Antwerp. All our terminals have tri-modal access and are equipped with state-of-the-art infrastructure, facilities and equipment. PSA (PSA Antwerp and MPET) is the largest container handler in the Port of Antwerp, capable of handling the world's largest vessels with a proven track record of high productivity. Additionally, containers can be stuffed and stripped by specialized personnel at all our terminals. PSA Antwerp and its hinterland partners also offer an extensive network of hinterland connections. PSA Antwerp is part of PSA International, one of the largest port groups in the world with headquarters in Singapore. With over two centuries of port management experience, PSA's proven track record is a hallmark of exellence. As the port operator of choice in the world's gateway hubs, PSA is renowed for best-in-class services and successful partnerships. 20 March 2019 | You’re standing on a 50 meter-high quay crane, in the Port of Antwerp, on the largest container terminal of Europe. Right in front of you, a gigantic containership sails by. Containers in every color are being loaded and unloaded around you. In the corner of your eye, your colleague is working on the electric wiring of the crane. ‘I can get used to this view’, is what you are thinking out loud. ‘Will you become our new colleague?’ - the VR simulation ends and you are back in the PSA/MPET/ATS job booth. 21st January 2019 | Today, ATS opened the doors of a second brand new garage at MPET. The new workshop was built on the Eastside of the Deurganckdok at quay 1718, to maintain all Rolling Equipment of this part of the MPET terminal. 28 December 2018 | In the beginning of December, staff from PSA Zeebrugge flew out to 'de Kleine Dennen' in Knokke. Kleine Dennen is an initiative of non-profit association De Patio, which offers accommodation, live-on-you-own training* and context guidance to youngsters in precarious conditions. The entire living area of the youngsters was completely repainted and revamped with brand new furniture.